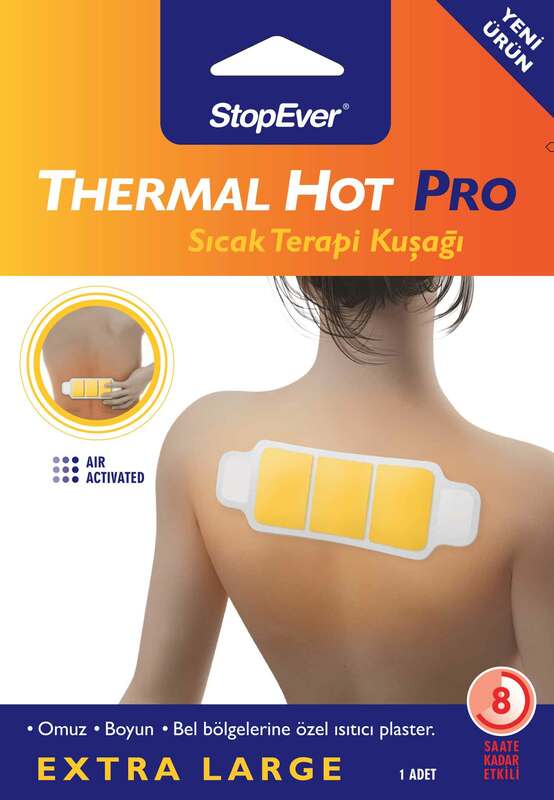 StopEver Thermal Hot Pro – Hot Therapy Strap warms up quickly with an exothermic natural hot therapy effect and lasts up to 8 hours. This helps to relieve muscular aches in the waist, neck, shoulders and other areas. It accelerates blood circulation with temperature effect, provides relaxation and relief in muscle problems in the region where it is applied. It is easy to use with high sticking ability, adapts to the applied skin surface and does not bother you in your daily life. It helps relieve muscle pain in the back, neck, shoulders and other areas. Open the special package of Hot Therapy Strap, remove the protective film on the band and stick the adhesive on clean and dry skin or preferably on underwear. There should be no cream or similar application in the area where it would be applied. When the strap comes out of the package and contacts with the air, it will start to give heat by itself. To remove the Hot Therapy Strap from its surface, pull it gently by holding it from its end. This product has been developed for external use. Drug-free, disposable. It is recommended that people with sensitive and problematic skin, diabetic patients, blood circulation problems, pregnant women, rheumatoid arthritis patients and people over 65 years of age, must consult their physicians before using the product. Do not use while asleep, with skin remedies and with any kind of extra heater. Do not stick the product to any area with any type of cream applied. Avoid factors that can create pressure on the strap. If you have a problem and it continues longer than a week, stop using the product and consult your doctor. Should not be used by persons under 12 years old or who are allergic to a heat / heating product before. 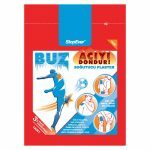 Do not apply on cream applied, injured or sensitive surfaces. If irritation, allergic reactions or unexpected effects would occur in your skin, terminate the usage immediately. Long-lasting hot application can lead to excessive reactions, especially on sensitive skin. If you have a sensitive skin for this reason, stop using the product immediately if you feel uncomfortable or any symptoms such as burning, redness, pain, rash and pruritus. Do not use the same surface for more than 8 hours in 24 hours period. To prevent irritation on sensitive skin, check the applied area during usage if required. Do not shake or tear the band, do not use broken/teared out products. Do not swallow the dust in the heat band. Wash with plenty of water in case of contact with eyes or skin. If accidentally the product would be swallowed, consult your doctor immediately. Keep the package in a place where children can not reach it and at room temperature. Package contents: 1 piece 285 x 85 mm. size heat-emitting strap.